I’ve had greens on my mind quite a bit lately, and so it was only a matter of time that a vegetable not classified as a “green” but which is very green would surface. Spring has exploded here, and it’s difficult to avoid the beautiful asparagus I’ve been seeing at the grocery store. It’s a bit challenging to pass up a sale, so invariably a bundle is put in the basket even though it wasn’t on my list. Unfortunately, the beautiful pencil thin stalks were pushed back in the vegetable drawer, and somewhat forgotten. For a vegetable that has been referred to as the Food of the Kings, this is a sad state of affairs. Often, recipes I’ve seen initiate a purchase, but in the case of the forgotten asparagus, it was the sale. Once I’ve made the purchase, then a seed is planted in my brain and I head for the recipes. Of course once I’d located a recipe, I realized I hadn’t seen the asparagus. Had I really purchased it? Not completely sure, I picked up another bunch at the store, and when I went through the vegetable drawer, while putting the groceries away, I found the other bundle still wrapped in plastic and looking as fresh as ever. Good thing we like asparagus because I now had quite a bit of it. Soup was definitely in order. 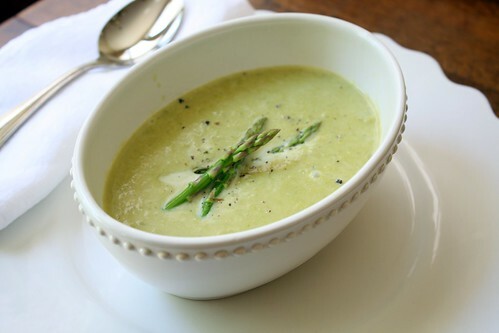 Beautiful silky, creamy and very green Cream of Asparagus soup — quite different from the Campbell’s my mother used to purchase for me when I was growing up. Remove the tips from a few nice stalks of asparagus to reserve as a garnish and set aside. 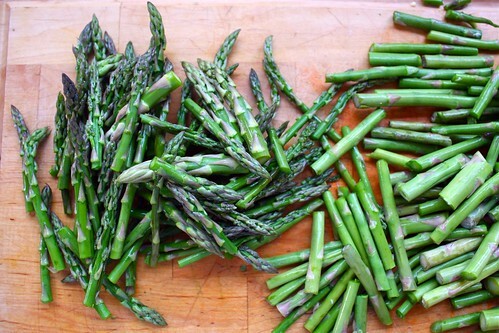 Cut the remainder of the asparagus into 1″ pieces. In a large sauce pan, melt 2 T of the butter over medium low heat and add the onions, cooking and stirring until softened. Add the asparagus pieces and cook about 5 minutes, stirring occasionally. Add about 5 c. of the broth and cover the pan. 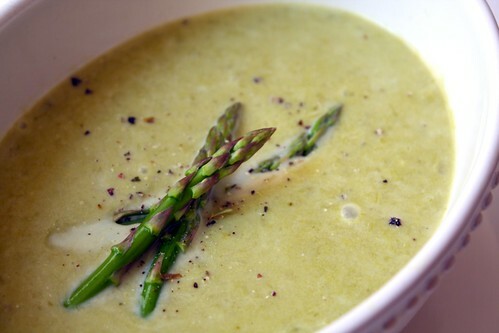 Bring to a simmer, cooking gently until the asparagus is soft, about 15-20 minutes. To prepare the garnish, while the asparagus mixture is cooking, blanch the reserved tips in boiling salted water. Allow to cook about 1-2 minutes for very thin tips and then plunge into an ice bath to stop the cooking. Drain and allow to dry on a clean towel. Using a blender or food processor, and working with small batches, ladle the hot soup carefully into the container. Pulse the mixture until smooth, empty into a large bowl, then repeat until all the soup has been blended. Return the blended soup to the pan and stir in the half-n-half and creme fraiche. If necessary, use the remaining cup of broth to thin the consistency. Salt and pepper to your liking, bring to a slow boil, and add the last tablespoon of butter. Stir in the lemon juice, divide into bowls and garnish with the blanched tips. Depending on the asparagus you have, it is best to trim the woody ends of each stalk and then using a veggie peeler, shave as much of the skin off as possible. This will help prevent stringiness. Usually, the smaller, more thin asparagus doesn’t require peeling. 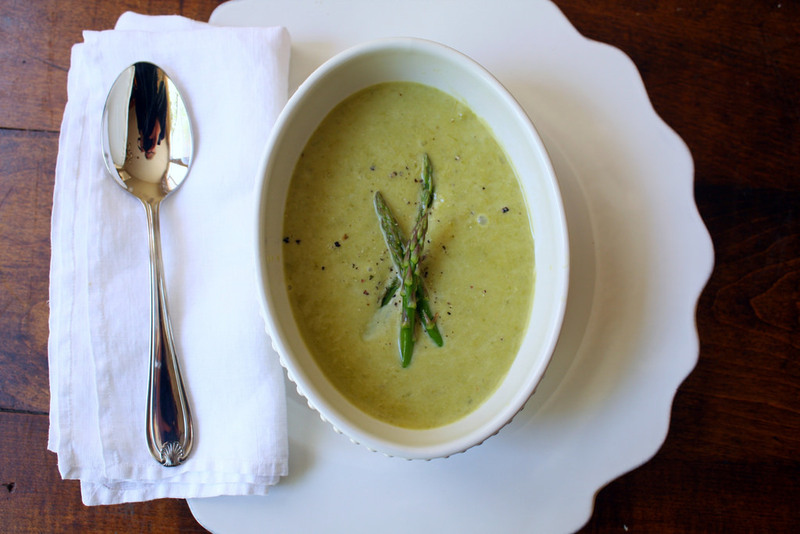 You can get by with less asparagus in this recipe if necessary and still not need to reduce the other quantities. It depends on how thick you like your soup. If you’d prefer, you can use a chinois to strain the soup after processing and before returning it to the pan. It really does help turn out a smooth soup. I’m thinking that the tips are so lovely, why not keep all of them separate to stir in later. I love a chunky soup. This is a very pleasant, easy recipe that is quite satisfying for dinner or lunch. It keeps easily in a covered container for 2 days. To make ahead, puree and store in a well-sealed container in the fridge. To prepare for serving, add the half-n-half, creme fraiche, lemon, and season. Stir well and heat before serving. This recipe is an adaptation of one originally published in Gourmet in 2001 and is available here. Asparagus is another amazing food that is packed full of folate, competing with oranges for one of the biggest sources. If you remember, I mentioned that in my Spring Salad post not too long ago. It’s also a big source of cancer-fighting antioxidants: Vitamin A, C, and E. The tips are especially nutrient rich and if only gently steamed, make sure your body gets almost full benefit. 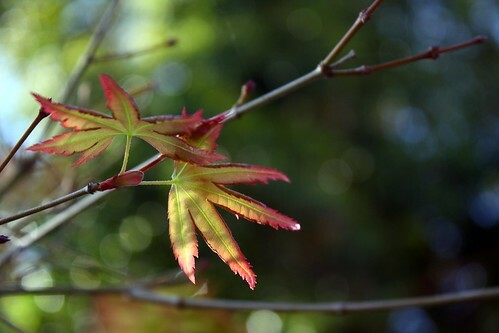 If too long in water, that benefit can be lessened. This soup is yet another qualifier for Chris of Mele Cotte’s event: Cooking to Combat Cancer III. If you haven’t stopped by to get the information, or thought of what you might send, get yourself in gear!